Don't you just hate it when you see someone you know at the end of a long hallway or street? When do you acknowledge each other's presence? When do you say hi or wave? Should you pretend you have to stop and tie a shoelace or duck into another room? All these worries are wiped away if you replace the approaching casual acquaintance with cute lovey dovey pugs! I am the queen of awkward social situations and am a big ol grump when it comes to having to deal with most people. So I think I'll embrace the humor of my flaws and do a series on my blog (in addition to Pugling Rivalry) called "Awkward and Annoying Situations Made Better with Pugs." 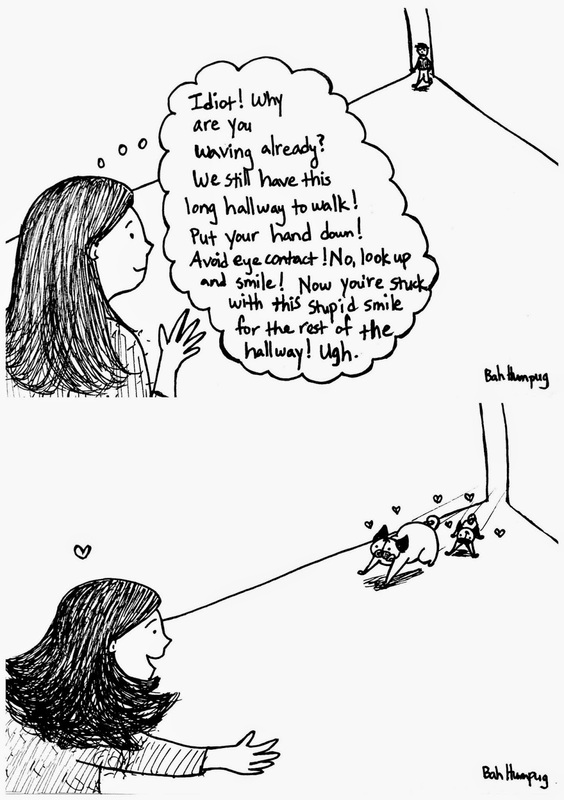 This is the first installment, "The Long Hallway." This is something near and dear to me as I encounter this situation everyday because my workplace consists of a super duper long hallway and I work at one end of it. Now if only your coworkers had darling pugs with them when they were walking towards you down that hall - with no self-consciousness whatsoever you could run towards them and chat vivaciously with their person about them while petting them.